Johnny Appleseed, whose real name was John Chapman, died near Fort Wayne 151 years ago last March. There was some argument about exactly where he was actually buried, but most people believe it was near the memorial marker that was eventually erected in his honor in what became Johnny Appleseed Park. John Chapman was born September 26, 1774, in Leominster, Mass. His father was Nathaniel Chapman, a farmer and carpenter. Nathaniel Chapman was a Minuteman in the Revolutionary War and fought at the battle of Bunker Hill in June 1775 and later with George Washington's army in New York. A Minuteman was a volunteer soldier who promised to be ready to fight at a moment's notice. John Chapman's ancestors came from England in 1639, and even the first ones to arrive here had an interest in growing trees. When Edward Chapman died in 1678, he left his wife "10 good bearing fruit trees near the end of the house. 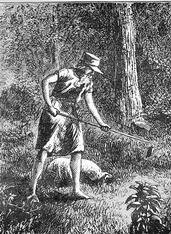 Johnny Appleseed's mother, Elizabeth Chapman, died when John was only 1 year old. Little is known about Johnny Appleseed's boyhood. Some say, however, that he spent the summers between 1782 and 1788 at the farm of a relative, Thomas Mann, near Mason, N.H.
Mann was also a veteran of Bunker Hill. He had a daughter, Betsey, who was Johnny Appleseed's cousin. Betsey later married a man named Sam Wilson, whose family also farmed in Mason. Sam Wilson was the person who became known as Uncle Sam. Some historians believe Sam Wilson and John Chapman- Uncle Sam and Johnny Appleseed- must have met during those summers Wilson was courting Johnny Appleseed's cousin Betsey. Wilson, who died in 1854, became known as Uncle Sam during the War of 1812. He sold meat to the Army, and his barrels were stamped with a large "U.S.," indicating the provisions were government-owned. One day, a federal official who was inspecting Sam Wilson's meatpacking plant asked a watchman what the "U.S." on the barrel meant. The watchman didn't know, but made a guess. "Uncle Sam," he announced. John Chapman was in his late teens or early 20s when he began wandering the new frontier planting apple orchards. He wanted to provide apple trees to the new settlers moving slowly westward. He also was a missionary, or spokesperson, for the Sweden- borgians, a Christian group named after Emanuel Swedenborg. Swedenborg was a Swedish scientist who lived from 1688 to 1772. In addition to his religious work he was credited with a number of inventions and drew up plans for a submarine and an airship. Johnny Appleseed spent time in western Pennsylvania and many years in Ohio. He was supposed to have been very self-reliant, finding his own food and sleeping outdoors. 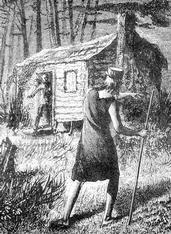 Frontier settlers soon began calling the strange young man Johnny Appleseed. An early newspaper editor in Fort Wayne said Chapman wore a "coarse coffee sack, with a hole cut in the center" for his head. Johnny Appleseed usually planted his apple orchards along streams. His earliest known apple nursery was planted about nine miles below Steubenville, Ohio, in a narrow valley near the Ohio River. It is known that Johnny Appleseed located his apple orchard nurseries near the main settlement routes and then traveled from one to another to care for the trees and sell seedlings to the settlers. Apples were very important to the early settlers. They offered something different in what could become boring daily meals. Apples were the easiest fruit to grow and to store for year-round use without adding expensive sugar. Families dried bushels of apples to eat during the winter, and they also made apple butter and apple cider. But Johnny Appleseed didn't wander the Midwest giving away apple seedlings and seeds, as many believe. He was a businessman. In 1806 the price of a seedling apple tree was 6 or 7 cents, which is what Johnny usually charged for his trees. Many say, however, that if setters couldn't pay he would accept cornmeal or old clothes or a promise to pay in the future. In some cases, he supposedly gave trees to needy families. Johnny Appleseed was not a poor man, as many believe. He had money, but he used it for charity and to further his work rather than for his personal comfort. Other nurserymen sold apple trees, too, many of better quality than what Johnny produced strictly from seeds. Other nurseryman grafted good quality branches onto seedling roots to produce better trees. Johnny did not. But he planted more nurseries than anyone else, and he located them just ahead of settlers moving west, so he became the most successful then and the most well-known now. How many other 18th-century nurserymen have had their story portrayed in a Walt Disney cartoon? Johnny would come to an area and borrow, lease or buy a plot of ground for his nursery. He would clear the ground, prepare the soil and plant his trees, using seeds he had gathered from cider mills back east. Many stories have been told about Johnny Appleseed over the years. It is not known now which are true and which are just a fable. Some say he was a vegetarian and never carried a weapon. One story has him putting out a campfire to keep a mosquito from being burned. Another was that he once slept in the snow rather than a warm cave so that he wouldn't disturb a sleeping bear and her cubs. If he did that, it seems like it would be as much for his own good as for the bears'. A story often told about Johnny Appleseed that has some basis in fact is his role in the Indian unrest in 1812 around Mansfield, Ohio. Johnny volunteered or was hired to travel the forest trails, which he knew as well as the Indians, to warn settlers of Indian activities. When 10 settler families wanted to send for help from 30 miles away, John Chapman made the trip. Some say he ran all the way. Others say he was on horseback. Either way, he brought soldiers to help the settlers. By 1830, Johnny Appleseed had moved his base of operations to Indiana. The first real evidence of Johnny Appleseed's presence in Fort Wayne is from April and May of 1834. There are records of him paying $250 for two pieces of land along the Maumee River east of Fort Wayne. John Dawson, a newspaper editor of that era, said John Chapman was in Fort Wayne as early as 1834. Another historian said he was here in 1828 and planted a nursery on the west side of the St. Joseph River, north of Fort Wayne. Others say he visited here as early as 1822. Fort Wayne appears to be the farthest west that John Chapman ever traveled. At least that's what we can prove from the land records and other such information. Johnny Appleseed legends, however, have him visiting Daniel Boone in Kentucky and Abraham Lincoln in Illinois. One California woman claimed he planted the first apple orchards in her state. In any event, by 1836, Johnny Appleseed had completed his move from Mansfield, Ohio, to Fort Wayne, and from that time on he considered himself a resident of Allen County. Most believe Johnny Appleseed died March 12, 1845, and was buried on the mound in the old Archer family cemetery, where the memorial to him stands today. His death notice ran in the March 22, 1845, Fort Wayne Sentinel, as seen at right. It said, in part, "Died at an advanced age, Mr. John Chapman (better known as Johnny Appleseed). His death was quite sudden. We saw him on our streets only a day or two previous." John Chapman would have been 70 at the time. Most agree Chapman died of a disease that newspaper editor Dawson called "the winter plague," which was probably a kind of pneumonia. Most also agree he died at the home of a Mr. Worth near the St. Joseph River.